BOX OFFICE & DOORS OPEN AT DUSK UNTIL. 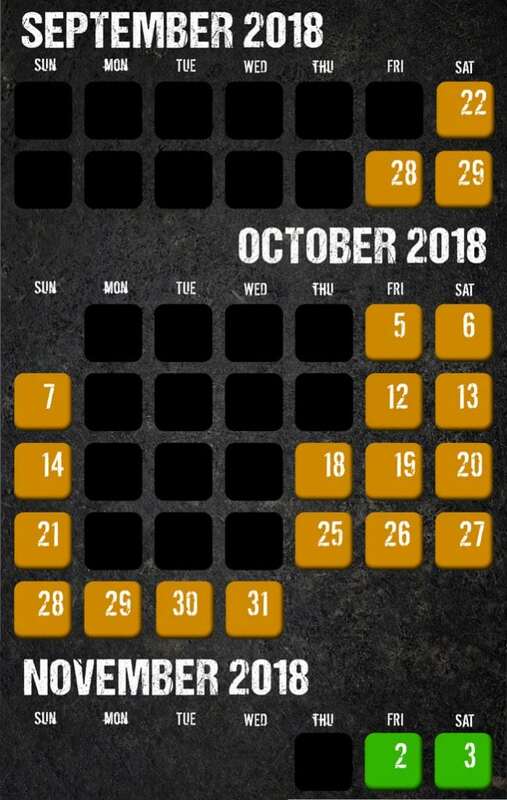 OPEN ALL DAYS HIGHLIGHTED IN THE CALENDAR. DAYS & HOURS OF OPERATION ARE SUBJECT TO CHANGE WITHOUT NOTICE. HOURS WILL BE TYPICALLY EXTENDED AS WE APPROACH HALLOWEEN. The Mortuary presents Blackout Night at Flashlight Fear Fest Weekend November 2nd & 3rd. Use the Promo Code “BLACKOUT5″when purchasing tickets online and your General Admission tickets are only $25 for our final weekend! Your last chance to experience this year’s Mortuary in a whole new light. Complete Darkness with only a mini light in hand to find your way. Fear The Dark! The Blood Center and The Mortuary team up each year for one of the largest award winning blood drives in the country, supporting the southern Louisiana community,,, specifically Greater New Orleans residents. Come out and support our efforts to give back to the community by helping others and donating the gift of life. If you give blood at The Mortuary, you will receive a FREE EXPRESS ADMISSION TICKET to “Skip The Box Office Line” to enter one of the best haunted attractions in the world. Your friends can go with you without giving blood for the regular ticket price, but with Express Admission faster access! BLOOD CENTER WILL BE ON SITE EVERY NIGHT THE MORTUARY IS OPEN!